Does anyone know of any good examples of armour worn by the English Knights at Agincourt? How did it differ from the French Knights' armour? I'm reading an amazing book - "Agincourt" by Sir Ranulph Fiennes, Bt. - and it's inspiring me to get a plate suit in 1415 style after I acquire my Westminter Psalter harness. My personal kit is contemporary to Agincourt and would be appropriate for an English gentleman man-at-arms in 1415. A more cutting edge kit than what I wear for a wealthier knight or lord would have included a more complete cuirass, besagues at the shoulder and likely a grand bascinet with integrated rigid throat defense. It is also possible the hourglass gauntlets at this time could feature extended metacarpal plates. One of the things that makes English field armor different from French armor during the middle Hundred Years War is the inclusion of a fully articulated arm harness from shoulder to wrist, as opposed to the separate 3/4 arm harness and discrete spaulder more common on the continent. The English preference was to fight on foot, and their armor was optimized for this type of fighting. Here's a photo from one my living history club's events this year of our post Agincourt scenario (2 weeks after victory, outside of Calais). It's not the best photo, but for this purpose it's informative because it contains a variety of armors that could be seen in 1415. On the far left, you have Sir Geoffrey (the one holding the pollaxe) in a very typical 1415 English armor like I was describing above. Great bascinet, full cuirass, long fauld, English arms. 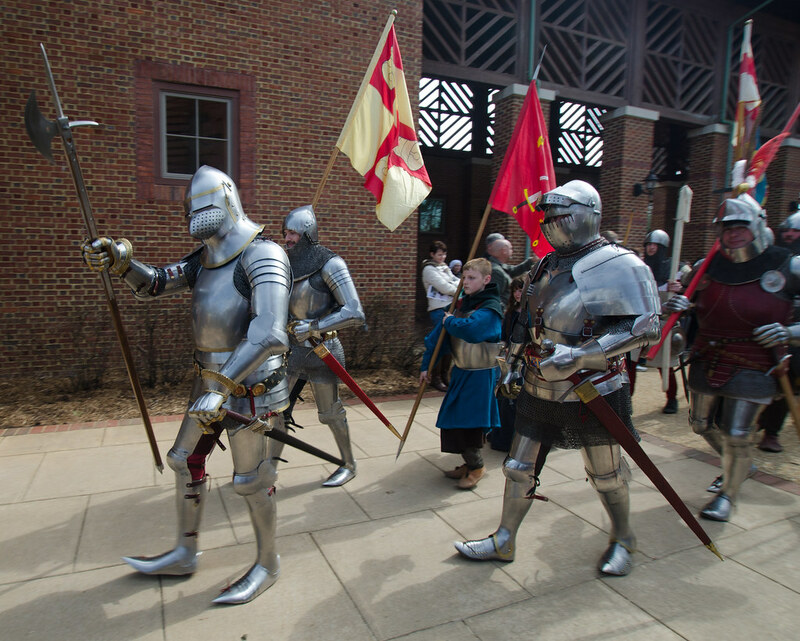 I'm in the back, next from the left with the bright red scabbard carrying the mostly bright yellow flag, think gentleman man-at-arms, not cutting edge for 1415, but still typical of the time. Breastplate with fauld, no backplate, English arms and wearing my bascinet with no visor. Next you have Bob with the dark red sword scabbard. He's in super cutting edge modern Italian export harness (the scenario was that this was captured armor as it is not 'English' in style. This would be the best armor of Western Europe in 1415 but not of an 'English' style. Then off the the right side is Will (requiescat in pace). His helmet is an early great bascinet, it retains a mail aventail but includes a rigid bevor plate to protect the thoat. His trunk armor is of a late 14th century style globose Coat of Plates, still serviceable in 1415 but going out of style, however it's been updated with round besagues in the armpits. As always, a truly excellent and helpful reply. I wondered, if I were to raise my budget to $12K, not including sword, do you know if I could get close to an Agincourt knight? Even if I have to take a phased approach, I am quite driven by the idea. Also, do you happen to have the contact number for Jeff at Custom Chainmail? I quite liked your review of his work. Unfortunately I don't have any contact numbers for Jeff at CC beyond the info on their website. Yes, $12k could probably get you there depending on your specific preferences. There's a lot of variance in price depending on things like materials, level of finish, fit, historical shaping and the status you wish to portray. Other budgetary considerations are travel for fittings should go that route as well. When getting into higher end armor it usually involves custom fittings in person, very long queues (sometimes on the scale of well over a year or more from initial inquiry to project start) for very in-demand and highly skilled armorers etc. You can save a lot of money if you go with an overseas armorer, as they generally charge a lot less than the high-end guys in the US, but obviously going to them for a fitting can become almost impossible, so you're taking a risk on final fit of some of the more sensitive pieces. Central European Armorers, especially in Poland and Czech Republic right now are turning out some of the nicest historical armor for the best prices. The further East you go, they seem to cater more to the modern medieval combat sport crowd (like Battle of the Nations) where some of the strict adherence to historical lines can be compromised for modern needs. If historical shaping is your goal, even within the US, you'll probably want to avoid the armorers who cater specifically to the SCA, again for similar reasons as the Battle of the Nations guys. *stainless 1.5 mm (16 gage). I'm assuming one is more preferable to the others in terms of durability and rust prevention? As always, I sincerely appreciate your thoughts. So, for modern armor, again, there's a lot more than thickness going on. Hardening comes into play a lot here. Mild steel (any steel with carbon content less than about 0.3%) cannot be heat hardened (it will get work hardened by beating it repeatedly with a hammer, but this is not the same thing, or as robust as heat hardening). This means when it's hit it dents relatively easily and if bent, it will remain bent. Medium and high carbon steels (>0.3% carbon) can be heated very hot and then quenched (rapidly cooled in oil, water or another solution), which re-aligns the structure of the steel in a way that makes it very hard, but brittle. So if you take hardened steel and drop it, it can crack or shatter. To make it usable as armor, you have to temper it. So it gets re-heated to a lower temperature than during hardening, and then is allowed to cool slowly. This alleviates some of the stresses created by the hardening process and leaves you with a steel that is hard, but not so hard that it is brittle. So it is very dent resistant, and when you bend it, it will spring back to the shape that it was formed into. Modern steels in the US are often named by their carbon content, so 1050 steel is 0.5% carbon, 1045 is 0.45% carbon etc... Europe uses C50 or C45 as their naming convention. The reason I wrote all that is because a piece of 1050 carbon steel, hardened and tempered can give you similar performance in a lighter gauge than a mild steel in a heavier gauge. Most people will tell you for helmets, you don't want anything lighter than 16 gauge, with 14 gauge being better. In addition to hardness, mass does help as well, since it will absorb impact if you're fighting in it. My helmet started life as 2mm steel and is now much thicker than that at the top and thinner than that at the edges because of the way it was made. Other components don't need to be as thick. For example, the lames on my sabatons are probably like 20 or 22 gauge. But where it's going to keep you from getting brain damage, you want nice thick high quality steel. So I would suggest 14 or maybe 16 gauge for a helmet, and probably 18 for most other 'large' plates and getting lighter from there. Reputable armorers will know this and be able to guide you and make recommendations. You shouldn't have to tell the armorer every different gauge of steel to use on every component, but you should discuss the purpose of the armor (i.e. live steel fighting) so they know to use proper weights of steel. At the $12k budget we talked about last night, that should be good enough to get you into something like 1050 spring steel, hardened and tempered. The great thing about hardened 1050 or other medium carbon steels, is that they don't dent nearly as easily as mild steel, so it's a little easier to maintain. Mild steel will need more heavy maintenance when it's getting beaten on frequently. So spring steels are a huge plus in the durability department. Level of finish will affect maintenance as well. A nice satin finish will help prevent rust. But no armor is 'rust proof' unless it's stainless steel, but that's not a historical steel and is usually obnoxiously shiny so I don't recommend it. The smoother the polish, the more resistant to rust (less microscopic nooks and crannies for water to get into). Regardless of whether it's mild or medium C steel, you will need to keep it oiled, and remove light surface rust from time to time (just part of the game). Historically armors were made from pure iron (0% carbon) to medium and even high carbon steels. In the 14th century hardening became more common, so using a hardened steel is still very historical. Interesting side note, they understood *how* to harden, but they didn't always seem to understand *why* certain steels could be hardened. We have evidence that some pure iron armors and low carbon steel armors were put through the heat treating process (which won't do anything). If you are willing to spend upwards of 10-12K on a harness, go for a nice medium carbon hardened/tempered spring steel armor in appropriate thicknesses (probably at least 16 if not 14 gauge for your head).